I'm from Vancouver, which arguably has the best dim sum in North America, so I often find myself desperately craving the stuff, especially around Chinese New Year. For the uninitiated, dim sum is Chinese "high tea", a lively brunch with friends and family where you share small plates of savory dumplings and other tasty delights. I had dim sum almost every weekend growing up. Then I moved to New York, tried dim sum a few times in Manhattan's Chinatown and was utterly disappointed. Several years ago at the Nice Restaurant on E. Broadway (now CLOSED), Kris found it bizarre when we were seated at a table with another family (sharing tables is common during busy weekends). The servers pushing the traditional dim sum carts were avoiding us like the plague, probably because Kris was the only white guy in the restaurant and I was the Chinese girl who couldn't speak Cantonese (the shame!). So I was forced to chase the carts around the crowded restaurant, wildly gesticulating to the servers to get the dishes I wanted. The quality of the food wasn't terrible - although the dumplings were a bit heavy on fat and filler, they were still tasty (probably from MSG). However, the situation went from bad to worse when someone started smoking at our shared table while we were eating! And don't even get me started on the horrifying condition of the bathrooms. To be fair, I've been back to Chinatown recently and had a positive experience at the Vegetarian Dim Sum House (24 Pell St). There's also a few Chinatown dim sum restaurants I haven't tried yet that have gotten decent reviews, like Dim Sum Go Go, Jing Fong, Golden Unicorn and the Peruvian/Chinese fusion newcomer, Red Egg. Curried Chicken Dumplings: Delectable curry chicken & veggie filling in a crisp pastry shell. One of our favorites. Fried Oysters with Sweet & Sour sauce (background) & Crispy Taro Root Shrimp (foreground): Perfectly fried oysters were heavenly with a thin crispy shell, plump and juicy on the inside, possibly our favorite dish (and Kris' doesn't even like oysters). Taro Shrimp were also executed well, crispy taro just melted in our mouths, jumbo shrimp were styled to looked like little swans (cute!) We enjoyed the shrimp but still prefer the traditional taro ball filling of minced pork. Lamb Dumplings: Pan fried crispy edges, super tender lamb/veggie filling with a hint of satay. Mouthwatering! Shrimp & Snow Pea Leaf Dumping: "Honey, my dumpling won't stop staring at me!" Translucent wrapper and shrimp filling were very traditional, but we enjoyed the pleasant bitterness from the addition of the pea leaves. Turnip Cake: Served with sweet hoisin sauce, crisp on the outside, soft and luscious on the inside. Tasty savory morsels of ham scattered throughout. The spicy XO garnish packed an intense seafood punch (but I ate it all anyways). Barbecue Duck Spring Rolls: crispy wrapper (perfectly fried and not greasy) with shredded duck/veggie filling, but nothing to get excited about. 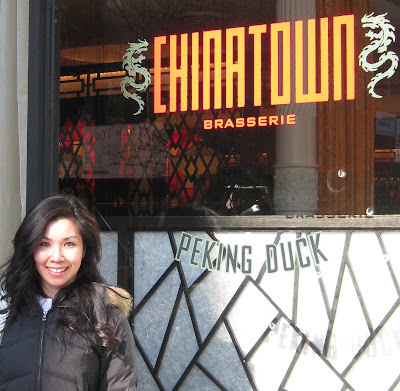 Overall, we had a really nice experience at Chinatown Brasserie. Chef Joe Ng did not disappoint - the dim sum was delicious, expertly prepared, and beautifully presented. The only catch is that the dishes are 2-3 times more expensive than Chinatown, but I guess that's the price you have to pay for good service, a gorgeous setting, and clean bathrooms. Cost:$63 (inclusive of tax) for 7 dim sum dishes. Even with our healthy appetites, we rarely spend more than $25 in a typical dim sum restaurant.